The Indie Ebook Review Site is a place where E-books written by independent authors (indie) are reviewed. Please have a look at our Staff pages to see who of our staff is currently reviewing at the moment and what genres they are reviewing. The first book of a trilogy, Deception Peak is a young adult adventure fantasy about a teenager, Ian Wilson, who follows his father through a portal that magically appears on their computer screen. They travel into a deceptively beautiful Realm, where horses run free, the wind sings prophetic melodies, and their computer avatars come to life. But when the two are separated, Ian is abducted by a tribe of dragon worshipers and is forced to find his courage. As he struggles for his freedom and embarks on a perilous search to find his father, Ian meets the true peacekeepers of the Realm. It's then that he learns there is a greater purpose for being there. The Ian’s Realm Saga was inspired mostly from the fantasy stories I read as a child. Alice in Wonderland, The Wizard of OZ, Peter Pan, Narnia, as well as adventure stories like Huckleberry Finn and Swiss Family Robinson. I love the worlds where there is enough beauty to enchant the reader, yet enough danger to make the trip an adventure. My grandsons were also an inspiration. I love being a grandma, but in some ways it’s nerve wracking because you can’t get in between mom and child even if you see something amiss. I know that growing up is a difficult thing to do, and it seems that for boys these days it’s even more difficult. So with my love for fantasy stories (C.S. Lewis, Tolkein, Carroll) and my passion for the teenager, I decided to write a book that boys would like to read about a character that is struggling just like they are but in a fantastical world, hoping it would give them a little more confidence knowing things aren’t really as bad as they appear to be. The air was still. The only sound was the soft babble of the creek, no owl’s cry, no frogs, no mosquitoes; no other sound whatsoever save the crackle of the fire. As the night wore on, Ian had trouble staying awake. When his father offered him his blanket, he was able to relax. Weary, he laid his head on his saddle and wrapped up, clutching the hilt of his sword. Soon, even though he didn’t mean to, Ian fell into a deep sleep.He dreamed he was riding an eight-point buck elk through the woods galloping past villages where chimneys of round houses made of hide released little puffs of blue smoke. Children wearing colorful costumes played on cobblestone roads and waved as he cantered by. The elk galloped to the shore of an ocean and went airborne. Shiny silver fish jumped beneath him as they flew over a fleet of ships sailing toward the horizon. They soared through the sky. Ian held onto its withers, fearless as they flew above the clouds toward the stars and the moon. The elk turned toward earth again, faster and faster they traveled until the wind whistled in their ears and Ian heard a melody. You will aft find your way, and wake up in your bed. When he landed, the wind was still singing, but now the voices were coming from the mountain. A woman mourned. His dad walked toward the sound and the steep foreboding cliffs. His father turned around. “Your mom’s in trouble up there,” he said before he disappeared into the brush. Ian dropped the wood that he used to poke at the fire, and called for his dad, but no answer returned. Instead, a cold hand grabbed him and covered his mouth, and then his world went dark. The thick smell of burnt wood hung over his head. The embers glowed. There was one small branch that lay on top of the coals, emitting a thin stream of smoke into the air. His father had just stoked the fire. “Did you have a dream?” Alex asked gently. Ian nodded and sat up. Sweat trickled down the side of his brow into his ears. “I don’t like this place. I can’t sleep.” His voice shook. Ian reached for a cup. Dianne Gardner, an award winning author, is also an illustrator living in the Pacific Northwest, USA. She's an active member of the Society of Children's Book Writers and Illustrators, and the National League of American Pen Women. Dianne has many ribbons for her portrait and plein air paintings, and uses her talents to illustrate her stories. 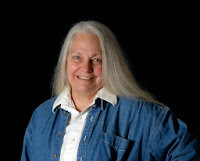 Books by Dianne are the Ian’s Realm Saga: Deception Peak, The Dragon Shield, and Rubies and Robbers four short stories in the A Tale of the Four Wizards series. She writes for middle grade and young adults targeting boys and adventure loving girls, and the young at heart. 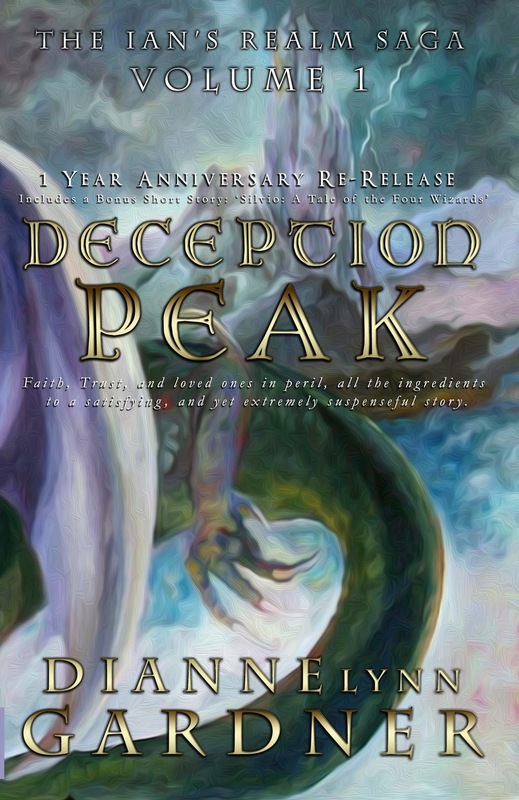 Newly edited, Deception Peak, Amazon's best seller two months in a row, has a face lift and it's better than ever now. Having combed through the edits, added some action, toughened Ian up and even gave him a better attitude toward Abbi, (something his fans have been asking for), you won't want to miss this version! I think you'll like what PDMI Rara Avis has done to spiff up Book I of the Ian's Realm Saga! And now, The Tale of the Four Wizards, Patriarchs of the Realm Silvio is a bonus feature with this book (and the other shorts will be included in the sequels) so you don't miss any of the tale. The first book of the Saga, Deception Peak is a young adult adventure fantasy about a teenager, Ian Wilson, who follows his father through a portal that magically appears on their computer screen. They travel into a deceptively beautiful Realm, where horses run free, the wind sings prophetic melodies, and their computer avatars come to life. But when the two are separated, Ian is abducted by a tribe of dragon worshipers and is forced to find his courage. As he struggles for his freedom and embarks on a perilous search to find his father, Ian meets the true peacekeepers of the Realm. It's then that he learns there is a greater purpose for being in there. This special edition is a completely revised and re-edited version, complete with beautiful, custom illustrations by Dianne Gardener and formatting design by PDMI Publishing. This special one year anniversary re-release includes the action packed short story 'Silvio: A Tale of the Four Wizards'. Great to meet you Dianne! Wishing you the best in all your publishing endeavors! Cheers! Thank you David for hosting, and thank you Dianne for sharing. The blog post looks great! Thanks you for hosting me on your blog today! Hello and welcome to the Indie Ebook Review Site. Please take a seat, pour yourself your favourite beverage and have a read of some of our reviews. We cover Science Fiction, Fantasy and Paranormal and have something for everyone. If you are an author you can also submit your book for review or request a guest poster spot.